Absolute care for your little one! 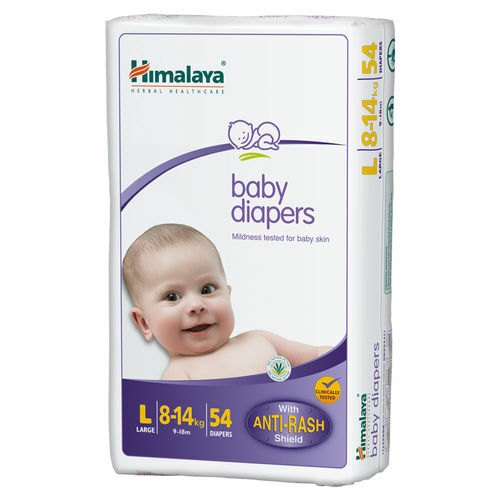 Himalaya Baby Diapers, with its unique, soft and easy-to-fit design, is specially formulated to provide the greatest comfort and care to your baby. is enriched with a blend of natural ingredients, Aloe Vera and Yashada bhasma, which form a protective anti-rash shield that reduces the activity of harmful enzymes*, inhibits the growth of microbes, and prevents diaper rash. Absorbs multiple wettings and ensures maximum protection from dampness. Clinically tested, hypoallergenic and free from fragrances. Aloe Vera and Yashada bhasma form a protective anti-rash shield that reduces the activity of harmful enzymes, inhibits the growth of microbes, and prevents diaper rash. Additional Information : A brand synonymous with safe and efficacious herbal products, Himalaya Herbals was founded in 1930 by Mr. M. Manal with a clear vision to bring Ayurveda to society in a contemporary form and to unravel the mystery behind the 5,000 year old system of medicine. Himalaya has pioneered the use of modern science to rediscover and validate ayurveda's secrets. ISO 9001:2000Cutting edge technology is employed to create pharmaceutical-grade ayurvedic products. The company has focused on developing safe, natural and innovative remedies that will help people lead richer, healthier lives.